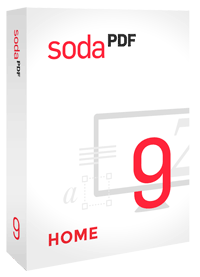 Soda PDF 9 Home - Giveaway for PC Welt readers! Thank you for your interest in Soda PDF 9 Home! Directly after registering below and confirming your email address, you will receive an email containing all data necessary to unlock Soda PDF 9 Home. Soda PDF - as the name suggests - is a software that helps you handle PDF files. Thanks to Soda PDF you will be able to easily edit, convert, create, review, comment, convert to PDF/A, add & remove pages and elements like images, create stamps, fill forms and a lot more! Don't want to receive our free newsletter? In that case feel free to buy the product directly via this link.